The International City Design Competition provided an excellent opportunity for city planners to explore and propose solutions for the future of urban settlements. Milwaukee, Wisconsin, is typical of a city which has experienced rapid economic development and industrial growth during the past century and which, as a consequence of the current shift to the postindustrial society, is undergoing profound changes in its historical manufacturing, commercial, and industrial base. As a result, we find a declining downtown area, an underutilized industrial waterfront and other industrial areas, older neighborhoods with railroad-based industry, and sections of more recent growth based on freeway transportation. The ICD Competition has asked for innovative proposals for the future of the city that respond to the social and economic forces of today. These proposals should be applicable to similar industrial cities so that the solutions are viable not only in Milwaukee, but also in industrial cities around the world which have the same needs. 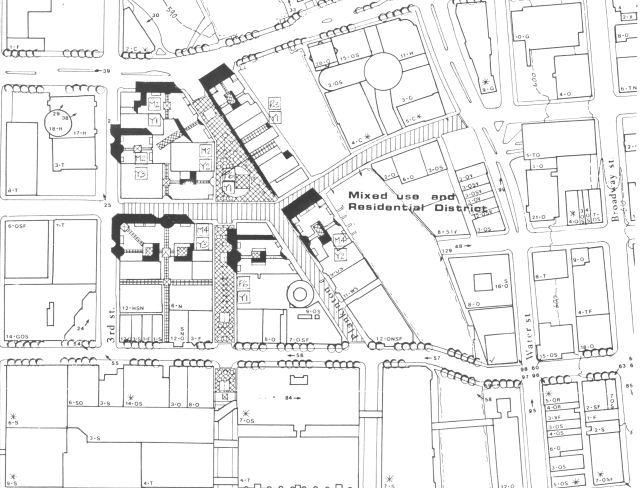 Because the downtown area is the most easily identifiable urban area that has in recent years been deprived of its original function and dynamism, the aim of the proposal which is set forth in this paper is to restore the cultural and social meaning once possessed by the area while fostering uses of the area relevant to contemporary social needs. During the last 40 years, the expansion of the highway system, the availability of cheaper land in the suburbs, the demographic composition of the typical family, and an economic system based on continuous growth have contributed to the decline in importance of the center of the city. Lacking an incentive for renovation, housing close to the downtown area has deteriorated while remaining too expensive to be turned to residential uses. In recent years, society has become more aware of land as, on one hand, a limited resource and, on the other hand in many cases, an amorphous entity devoid of significance for those who dwell upon it. By looking to the past in order to find clues that will help us to restore meaning to urban areas and, at the same time, looking to the future to discover new trends in household composition, living styles, and the availability of resources, we can start proposing solutions to the challenges of the existing urban environment. New life and increased activity can flourish in the central area of the city when more people live close to downtown and when the transportation system facilitates access to the public sites in this area. The first step in generating new activity is to promote new or renovated residential districts near downtown. The population that will benefit from development in this location in many cases does not have access to private automobiles because of either age or economic level. Other population segments that will be attracted to a renovated central residential district are those which enjoy the facilities of an urban environment that are unavailable in the suburbs. New trends in household composition for the next 30 years show that there will be a market for dwelling units smaller than the present types of new houses. Retired persons, single parents, newly independent persons, couples without children, etc., will increasingly require smaller and more affordable housing. A survey of the data provided by the ICD Competition reveals that, in the age group between 10 and 19 years, there are 158,011 inhabitants who, in the next 10 years, will become independent of their original families. Some portion of this group will require smaller and more affordable types of housing. Another source of residents for the new downtown district is the approximately 30% of the population in Milwaukee County which has an annual income of between $5,000 and $15,000. In this group can be included the newly independent population mentioned above that will require smaller living spaces. In the next 20 years, the population that will become independent is about 133,838 inhabitants (See Table 3), and some portion of this population will require affordable housing. The population over the age of 65, which we can assume will be retired workers, will in the next 10 years be 52,580 inhabitants. Most of them will be living without their children, and their original houses might be too large and too expensive to maintain. This group will need smaller dwelling units with easy access to services such as grocery stores, medical care, recreation, etc. we can make the same assumptions for the next 20 years, when the population over 65 years old will number 98,174, and for the next 30 years, when this group will number 93,521. While it is difficult to predict how many new housing units will be necessary in future years, providing a flexible design scheme that allows different sized dwellings within a certain range, and the possibility of growth without disturbing the existing urban fabric, can help to deal with the future of new housing for a growing sector in the Milwaukee population. The method followed is the presentation of a set of general goals along with a set of strategies to achieve each of these goals. Diagrams, short statements, plans, and tridimensional drawings are used to set forth the proposed solutions and alternatives for the future development of the type of industrial city represented by Milwaukee. Following the existing trend of development in Downtown Milwaukee and the sets of goals stated in the competition program, this proposal reinforces some existing areas and creates new subdistricts to make Downtown the focal point for the region. In order to make the Downtown Center a more livable area, one of the main objectives of this proposal is to provide different types of housing in Downtown. The design scheme proposes a morphological and functional structure of links (streets), public, semipublic, and private spaces (courtyards, squares, etc. ), and building masses that will allow the insertion of different uses according to the needs that develop in future years. A) Create a more livable and active downtown with more residential areas closely related to it. C) Improve the definition between the Central Core and the Park. D) Reinforce the existing Retail Core and the Theatre District. E) Take advantage of the existing activity in the Office Core for new activities adjacent to the park. A) Development of new subdistrict and renovation of existing subareas in downtown providing different housing types. B) Improvements in main street (Wisconsin Ave., Kilbourn Ave., Water St. etc.). Create a hierarchy of streets in the new subdistrict and in the existing ones (main vehicular streets, secondary streets, pedestrian streets, connections with courtyards, etc.). Establish a flexible and fast transportation system exclusively for downtown. C) Create a subdistrict that has an edge to the park providing a gateway to Wisconsin Ave.
D) Create a new subdistrict with pedestrian streets and a square with renovated residential buildings and new mixed use buildings. 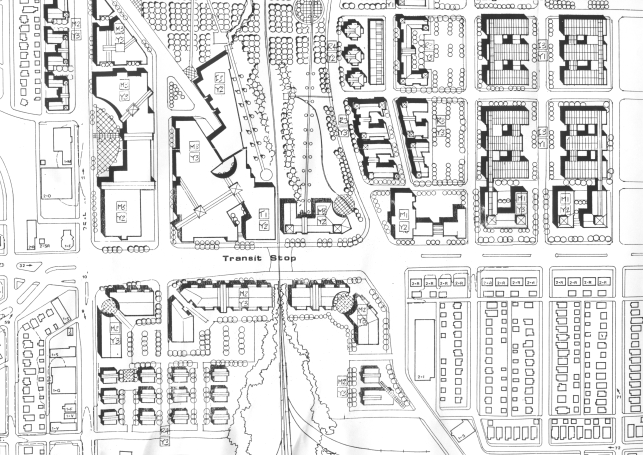 E) Create a new subdistrict with residential, office and commercial uses between the park and the Office Core. 2.Subdistrict between the Park and Wisconsin Ave.
4. The area surrounding the Retail Center north of Kilbourn Ave.
Chicago St. is proposed to work as a main street that will link the area of the Summerfest and the Milwaukee River with the continuation of the Riverwalk from Downtown. Water St. will connect this district with the Retail District and the Business District. Two blocks of Broadway St., north of Chicago St., will work as a pedestrian-oriented street with a Produce market in one of the blocks. New housing development is proposed in vacant lots. Commercial and residential development is proposed along Water St. and Chicago St. A park is proposed between the area of the Summerfest and the beginning of the Third ward residential area. This park will provide parking spaces for Summerfest. A series of courtyards is proposed for the blocks with commercial activity in order to create a characteristic feature for this District. Subdistrict Between the Park and Wisconsin Ave. This area will work as a subdistrict linking the existing Park with the Business Center and the Retail Center on Wisconsin Ave. The new buildings will define the entrance to the main street in Downtown and will provide a housing area in walking distance of the Business and Retail Centers. 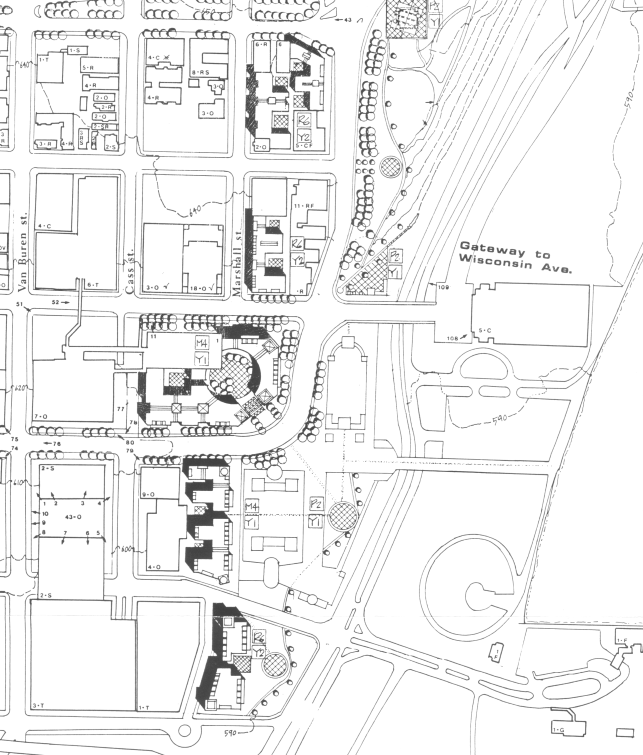 A formal square is proposed at the intersection of Kilbourn and Prospect Avenues in order to mark the beginning of the civic axis (Kilbourn Ave.) in Downtown. The mixed-use buildings will provide some semipublic spaces accessible in restricted hours. Public spaces will be provided in the future terraces and in the new squares in the Park. The new buildings will help to define the street space and will create a characteristic “sense of place” different from other subdistricts in Downtown. This subdistrict will reinforce the two adjacent districts, providing new residential and commercial areas. Existing buildings on Jefferson St. will be renovated, providing new residential space. New buildings will have commercial and cultural activities on the ground floor and residential or office space on the upper floors. The scale of the new buildings will be between 10 and 20 stories. A new square and pedestrian street are proposed between Kilbourn Ave. and the Grand Avenue mall. New pedestrian links to the Riverwalk through the new buildings and through some existing alleys will promote more activity close to the Milwaukee River. A new entrance to the Grand Avenue Mall is proposed as the culmination of the pedestrian street that connects the Retail Center with Kilbourn Ave., the civic axis of Downtown. Existing alleys are proposed to work as arcades linking the street with the interior courtyards. The purpose of these arcades, as in other subdistricts (Third Ward, Wisconsin Ave., and the Park) is to provide another level of connections on the pedestrian scale, related to the existing city grid, and linking public or semi-public spaces (interior courtyards, new squares, pedestrian streets). This covered system of connections would be an alternative to the skywalk system, increasing pedestrian activity at street level. Wells St., between Third St. and Water St., and Plankington St., between Wells St. and Wisconsin Ave., will be a street shared only by pedestrians and some type of public transportation that will link the different districts in Downtown. The Area Surrounding the Retail Center North of Kilbourn Ave. The general strategy for this area is based on the improvement of the condition existing in this subdistrict. The existing shopping center will be renovated. One block on Van Buren St. will be shared by only pedestrians and public transportation, providing a public space as an extension of the renovated shopping center. 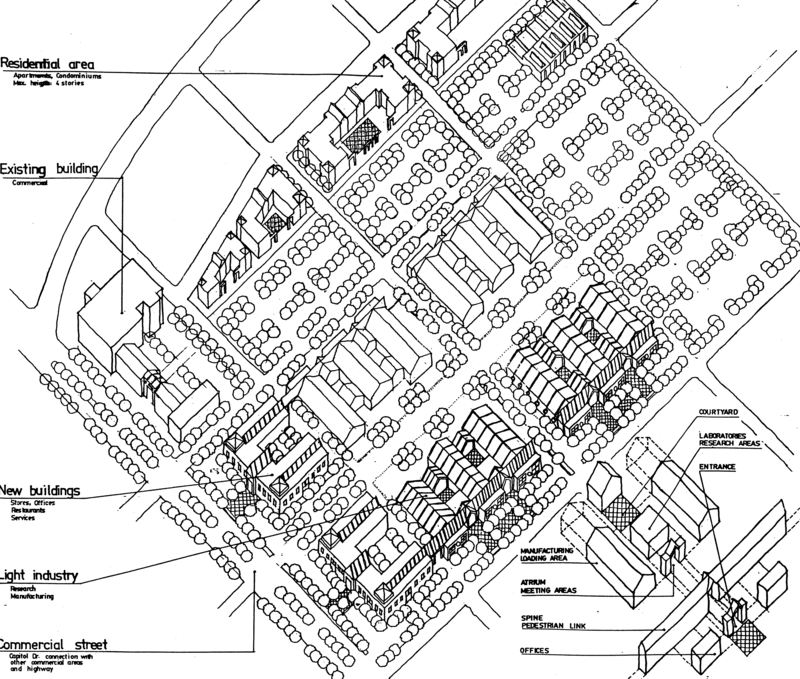 New infill development with mixed-use buildings is proposed for the blocks adjacent to the shopping center. The maximum height would be four or five stories with stores and small offices on the ground floor and apartments on the upper floors. 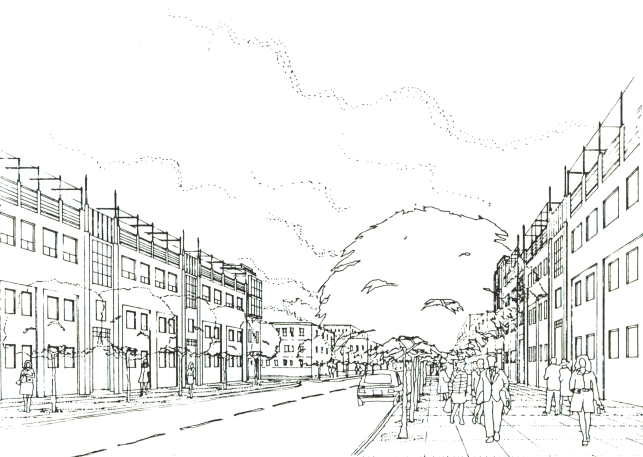 Pedestrian links are proposed for some existing large blocks associated with new squares that will provide green space for recreation for the new housing developments. The purpose of these strategies is to reinforce the identity of the existing residential area, strengthening its core and promoting new infill development. Existing streets will also be improved in order to reinforce the links of this are to the rest of Downtown. The improvements will consist of new pavement surfaces, new tree plantings, new street furniture, and renovations of existing buildings. Improve the quality of living in the existing neighborhoods. B) Link the neighborhoods around the existing underutilized industrial land. C) Maintain sources of employment in the existing neighborhoods. D) Provide more residential areas closer to downtown as an alternative to suburban development. E) Provide alternatives housing units for a changing household market. F) Provide fast and easy access to downtown and to other areas of the city. Create a park that provides open spaces and sport facilities for the existing neighborhoods. C) Create light industrial areas and commercial uses that will bring new economic activity to the neighborhoods. D) Create residential areas on the edge of the park and in new blocks related to the new grid. E) Smaller housing types are proposed for the new residential blocks. F) Create a light rail transit system, with two new transit stops on the intersection of the existing railroad lines and the major avenues. The proposal for the older Neighborhood District involves four main modifications. The first modification is to replace underutilized or vacant industrial structures with new housing units. The second is to keep some existing factory buildings and create new light-industry areas near the proposed Transit Stops. The third is to create a park in the vacant land in order to link the neighborhoods and to provide new amenities that will improve the quality of life in the surrounding neighborhoods. The fourth modification is to keep some of the existing railroad lines in order to provide transportation service to some of the remaining factories and warehouses and to the new light-industry areas. In the future, the railroad will be used for a public transit system. Two Transit Stops are proposed: one on Capital Drive and the other on Hampton Ave.
Large factory buildings and warehouses near the railroad will be eliminated in favor of new housing units related to the park. This will consolidate the adjacent neighborhoods providing new residential areas as an alternative to suburban development. The increase in population in these neighborhoods will require more services. These needs will be met by new stores, services, and restaurants on Hampton Ave. and Capitol Dr. close to the future Transit Stops. A large factory building on Hampton Ave. and next to the railroad is proposed for renovation and subdivision into smaller units for offices and light industry. Extensions of the new park and landscaped parking areas are used as green buffers between the residential areas and the light-industry areas. The existing street grid will be extended to the edge of the new park. New residential blocks will be half the size of the existing blocks in order to allow better public access to the park from the residential areas. Two new curvilinear streets will mark the edge of the park and link Capitol Dr. and Hampton Ave. through the new park and residential areas. The existing Congress St. will continue through the park and under the railroad line in order to connect the neighborhoods on both sides of the railroad. This new street will provide two circuits or alternatives for vehicular circulation around the park. A network of pedestrian paths will be provided in order to link sports activities in the park, small squares at the end of some of the streets and the train station with the lake area. Two distinct main areas are proposed for the park: the “lake,” a very open area with long vistas and a bridge for the railroad; and the “forest,” a heavily wooded area with more intimate spaces and a network of paths that link different areas of use. Informal or more picturesque open spaces will be defined by tree masses that link these two areas and specific sites for sport fields. The edge of the park will be defined by some of the existing residential areas, as well as by new housing units, which are defined as “urban villas” and provide a visible edge to the park while preserving a “permeable” quality for the residential area. 1.”Urban villas,” consisting of from four to six apartments or condominiums, are proposed for the new streets that constitute the edge of the park. 2. New “townhouses” or “row houses” are proposed for the streets that do not border the park but are next to the existing housing areas. These building types will provide the same density as the existing dwellings and will not disturb the scale of the existing housing units. 3. Some new “apartment buildings” of three to four stories are proposed for the areas close to the train stations on Capitol Drive and Hampton Ave. These dwellings will have the advantage of being close to a Transit Stop and to the park. These housing units might be smaller and more affordable than the two previously described building types. 4. Commercial buildings that could accommodate office space, stores, and restaurants are proposed on vacant sites and adjacent to existing commercial buildings on Capitol Drive and Hampton Ave.
5. 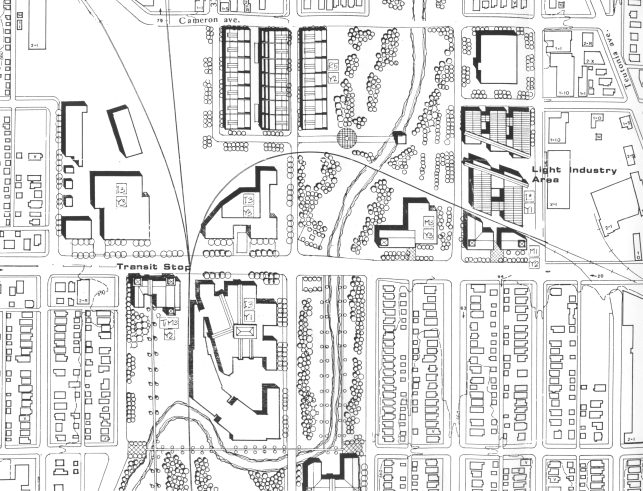 Small-scale light industry and research laboratories are proposed for-two areas: One occupies two blocks north of Capitol Drive and is connected to commercial buildings on this street. The other area, north of Hampton Ave., occupies two blocks and is related to the railroad lines and to the park through a landscaped parking area. These buildings have an office and research area, a manufacturing area, and a pedestrian spine that connects the different areas. There is a meeting space or “atrium,” where the pedestrian “spine” meets the “entrance.” This building type has a flexible structure that allows growth in different areas of the building. The street is defined by a continuous facade that is articulated by the entrances, and lines of trees define the parking areas in front of the buildings. 6. A new building type with a workshop on the ground floor and a one-family dwelling above is proposed for an area one block north of Hampton Ave. This building type could create a subdistrict characterized by small businesses, such as furniture repair, antiques, printing, etc., that would be linked to the extension of the park and the availability of good vehicular and public transportation. The major connectors in this area are Howell Ave. to downtown, the airport, and other suburban areas to the south; and railroad lines to downtown and to the area south of this site. Existing uses of the site are two-story apartments on Puetz Ave. a high school on Puetz Ave. and Howell Ave., a public library, a post office, a shopping center, and other government offices close to this intersection. The Oak Creek Parkway is located in the southern part of the site. North of the site there is an industrial area that extends to the airport area. The proposal assumes that, in the future, the suburban growth will be kept within certain limits and will be slower than it has been in the past. Keep future suburban development confine to the present limits of the metropolitan area. B) Create a “sense of place” in the existing suburban area. D) Provide public recreational areas for the existing and new residential, commercial and industrial areas. E) Provide a variety of housing types that can be developed according to the future market demand. A) Maintain Howell Ave. as the major transit connector with the airport, downtown, and IH94 to Chicago. B) Reinforce the existing node at the intersection of Puetz Ave. and Howell Ave. with retail spaces, offices, and residential uses. C) Create a train stop on Puetz Ave., and with it some retail and commercial space and medium density housing. D) Link these two nodes with a “boulevard” with residential and commercial development. E) An industrial park with a railroad connection is proposed next to the existing factory area. A greenbelt between the industrial park and the development on Puetz is proposed in order to buffer the industrial area from other uses. F) A new parkway is proposed between the Oak Creek Parkway and the existing Willow Height Park, north of the site. 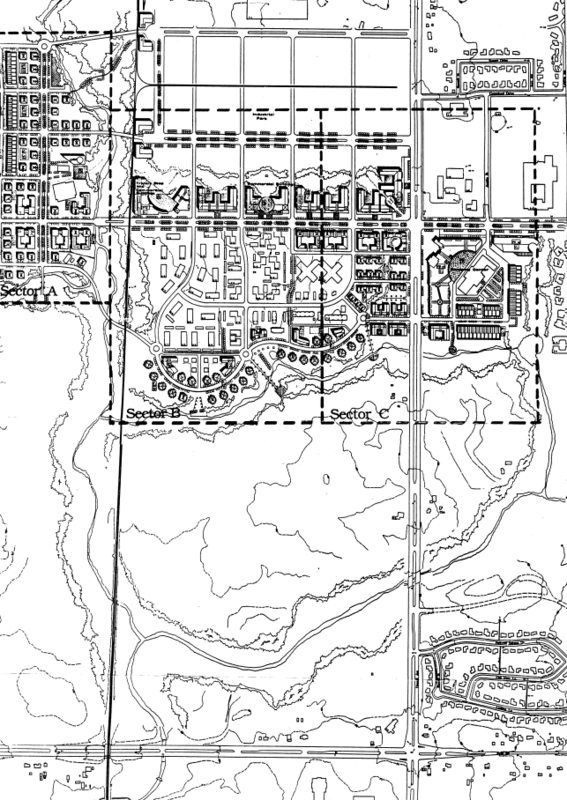 This new parkway will be connected to the greenbelt between the industrial park and Puetz Ave.
G ) An edge to the new residential development is proposed to the south of Puetz Ave. and the existing apartments. Alternative housing types could be located along this new street. This new “boulevard” is defined by markers or gateways that help to give identity to the new housing areas.